Probably one of the most well-known piano songs of all time is Debussy’s Clair de Lune. But it’s also very difficult. So as per a request on this channel, I decided that it would be fun to do a discussion on the tune. In today’s episode, we’ll talk about the history of the piece, its interpretation, sound and style, and then listen to some audio clips and dissect it a little. My intention for this video isn’t to do a heavy, academic analysis of Clair de Lune – if that’s what you’re looking for, you’ll definitely be disappointed. As per the title, “For Casual Music Fans”, I wanted to create a video that even non-nerdy music listeners could understand. That said, it’s a fine line between getting super nerdy, and watering down the content too much, so I’m trying to strike a balance. And if there’s anything you’d like to add, feel free to leave a comment and share your thoughts – it’s great for me to read, but also great for other people who watch these videos as well. Clair de Lune isn’t actually even a standalone piece. It’s part of a larger whole – a suite called “Suite bergamasque”. 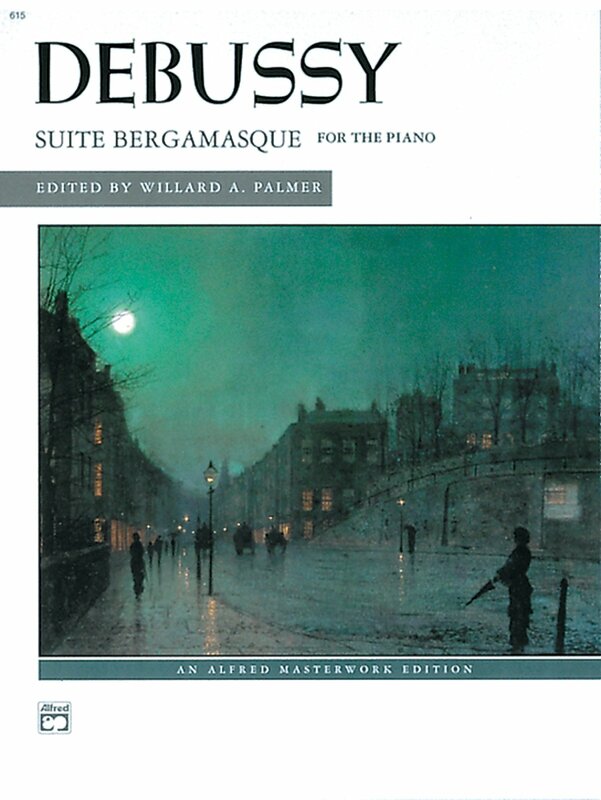 The suite was published in 1905 by the French composer Claude Debussy. This means it was written in the 20th Century era of music, also referred to as the modern era (100 years ago might not seem modern, but it is compared to music from 1000 years ago). Clair de Lune is the third movement of the four-movement suite. The title is French for “Moonlight”, and is based off a poem by Paul Verlaine. A lot of composers took inspiration from poetry, and Debussy was no exception. It’s actually a super awesome poem – even the translation – so I’ll link it below if you want to check it out. Let’s take a really quick listen to the intro of Clair de Lune, in case you haven’t heard it or need a refresher on what it sounds like. It’s interesting because we have this perception of Clair de Lune being this ridiculously beautiful song – which it is – but in the context of the entire Suite Bergamasque, it really stands out. See, a Bergamask is basically a clumsy, clownish dance – like the kind of exaggerated dance you’d do if you were joking around. So it’s interesting that such a tender, lovely piece like Clair de Lune would be part of a collection of tunes about clumsy dancing. But if you especially take a listen to the minuet (the second movement), you can definitely hear a bit of goofiness coming through. Additionally, it isn’t entirely random that Debussy threw in this tender piece in the middle of a rather oddball assortment of tunes. In the poem “Clair de Lune”, bergamasks are referenced in the second line, which loosely ties things together. Whether you’re learning this song or just appreciating it, it’s important to know where Debussy was coming from as a songwriter. He was opposed to the Romantic style of playing with chord patterns and themes. Basically his intent wasn’t to write a catchy tune, but rather an experience, a song that sets a scene and takes you through it. So now we’re going to look at the different parts, and do an analysis of Clair de Lune. Though it doesn’t have a formal structure, can be loosely divided into three different sections – a type of ternary form, or three part form. You already heard the introduction at the beginning of this video – it’s very sparse and lacks any distinctive rhythm. Claude Debussy has a quote that goes something like, “Music is the space between the notes,” and you can really feel his meaning by the intro alone. There’s a lot of open, empty space in the first part, which is just as captivating as if there were lots of fast, rapid notes like in the second section. One of my favorite parts of the piece, and one of the most recognizable parts, is on the second page when all the notes come together, still very quietly, but the effect is powerful. Without going too far with musical jargon, the tonality never feels truly secure in this piece. Tonality is when you say, “This song is in the key of C major, or D flat major,” or whatever it is. Certain chords strengthen and emphasize the tonality of a piece (like use of the tonic and dominant chords). But what Debussy does here is creates tonal ambiguity – you never really feel secure in the key, which is D flat major. He does this in a number of ways, but one way, which you can see right from the opening notes, is that though he’s hinting at a tonic D flat major chord, there’s actually no Db note played anywhere, at least not until later on. There also aren’t any dominant chords (Ab major in this case) to strengthen the tone. The music grows in agitation, featuring some of Debussy’s characteristic rule-breaking when it comes to chords. He didn’t choose clusters of notes to adhere to any standard – I presume he chose them for the specific mood they created, even if – and maybe even especially if – they were dissonant. We’ll take a listen to those dissonant, chordal parts as they peak into beautiful rolled high notes that always remind me of a harp, and that lead us to the second section. Part two is when things really start rolling along in this song. It’s much more technically demanding than the first part, but just because the first part is physically simpler, it’s got so much subtlety that it’s still about as challenging as this second, faster part. Let’s take a quick listen to the rolling arpeggios and simple right hand melody. When listening to Debussy, it helps to keep Impressionist paintings in mind. Debussy’s style was in the same vein, only on piano instead of on a canvas. Clair de Lune, like an impressionist painting, is really all about capturing the essence of something – not so much the details but the spirit. So Clair de Lune is decidedly un-catchy, lacks a really distinctive rhythm, and breaks all kinds of harmonic “rules” that musicians had been following for hundreds of years. But it paints a picture, it creates a mood, and takes us somewhere beautiful. Not in an intellectual “that’s a good song” kind of way, but in a way that tugs at the spirit. All of the second section involves running arpeggios and plenty of motion. Take a listen to the climactic moment of the piece – there isn’t a grand crescendo or even much build, as this tune defies those kinds of stereotypical song structures – but the moment when all the notes start tumbling downward like a waterfall is definitely a pinnacle of sorts. Part 3 sees a return to the opening theme, but it’s not an exact replica. Arpeggio fragments continue in the left hand, creating a fluid and changing harmony. An interesting change from the beginning is that, though the beginning implied a Db major chord, and a “happier” sound because of it, the third part, echoing the first part, takes it in a minor, “sadder” direction, implying an F minor harmony. It’s still peaceful like the beginning, but maybe a little more mysterious and melancholic. Finally, in the ending arpeggios that echo part two, we get that perfect cadence, the dominant-to-tonic harmony that Debussy used extremely sparingly in the entire piece. Finally, at the end of the song, we get a sense of peace by hearing that cadence. It gives us our tonal footing, and makes the final notes feel well-earned and satisfying. And since we’ve just spent this blog post/video dissecting Clair de Lune in little parts, here’s a video of the piece in its entirety. It’s one of my favorite versions, performed by Angela Hewitt. Enjoy! Thanks for stopping by for this analysis of Clair de Lune! It was a lot of fun to do – let me know if you’re into this kind of video and I’ll maybe do some more like it in the future. From Suite Bergamasque (For Piano Solo (Original Version, Unedited)). Composed by Claude Debussy (1862-1918). Masterworks; Piano Solo; Solo. Kalmus Edition. Form: Suite. Impressionistic. Single piece. 7 pages. Published by Kalmus Classic Edition (AP.K03372). Prelude, Menuet, Clair de lune, Passepied. Composed by Claude Debussy (1862-1918). Edited by Christopher Harding. Schirmer Performance Editions. Classical. Softcover Audio Online. 48 pages. Published by G. Schirmer (HL.297082).